People hurt people. You have heard that before, I'm sure. We have been talking about healing and I could guess that most of us are healing from something someone did to us. So it would make sense that you might be wary of trusting another person again. Trust is a complicated thing, especially if you've been hurt. 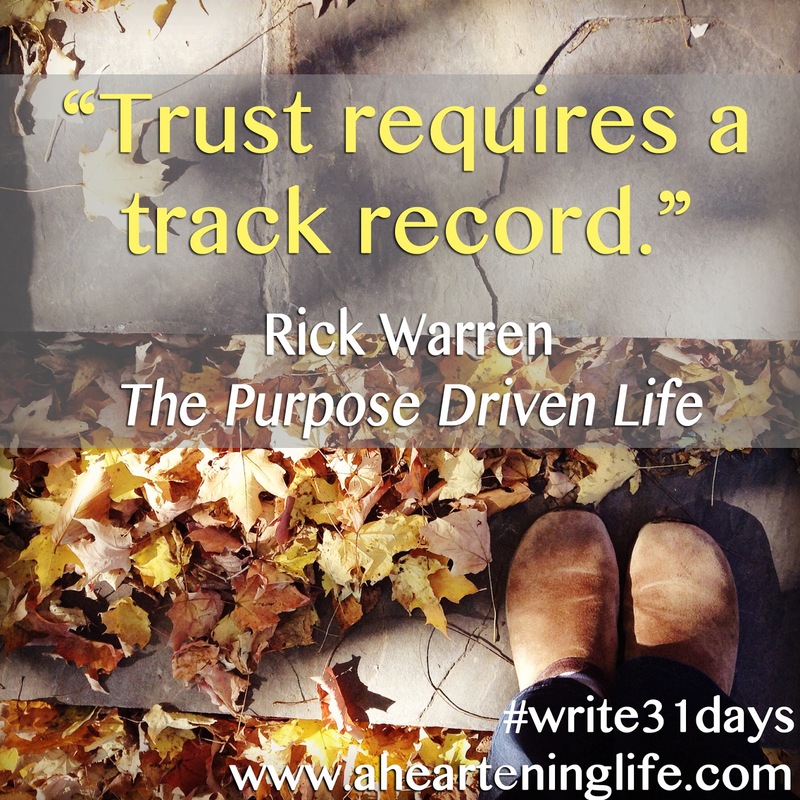 Rick Warren, in The Purpose Driven Life: What on Earth Am I Here for?, writes, "Trust requires a track record." At some point, in order to trust someone, what they say and what they do have to line up. Their words and actions will reveal who they are and whether they are safe and trustworthy for you. In spite of the fact that people have hurt me in the past, healing that hurt actually happens best in relationship with people. Whether it is a close friend you can confide in or a group of people who have experienced similar pain, having a place to share your story, your honest feelings, disappointments, fears and doubts without judgement is cathartic. I've had the privilege of walking alongside such a group of women since May. To watch how God can work and heal in this kind of environment is an honor. It has been a true testament to how feeling connected and safe with people can encourage and break down the walls we build to protect ourselves. God uses the "right" people to help you. They will hear you, affirm you, and love you no matter what you share. They will pull up a chair or "sit in the mud with you" because they care that much. And they will be a healing balm to the wounds other people have caused. A relationship built on a loving foundation won't be perfect. It might even be hard sometimes. But it is one on which you can rely. I am in no way an expert on this topic. For more information on finding safe people you may be interested in reading the book, Safe People (How to Find Relationships That Are Good for You and Avoid Those That Aren’t) by Dr. Henry Cloud & Dr. John Townsend.